We have carved a niche as Manufacturer, Supplier and Exporter of ASTM B127 Nickel Alloy Plates in Mumbai, Maharashtra. They are designed by our team of qualified and skilled personnel who incorporate top-drawer Nickel Alloy and ultra-modern machines for their fabrication. 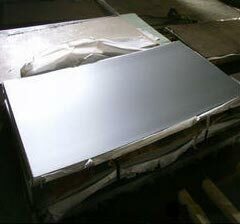 The Nickel Alloy Plates are available with us in diverse standards and specifications in order to meet the variegated demands of our buyers. Order big or small, timely delivery is assured!